Living in Denmark, it is easy to go to Sweden. It takes only 40 minutes from Copenhagen by car. So I sometimes go there, and I have enjoyed every pastry I have tried. 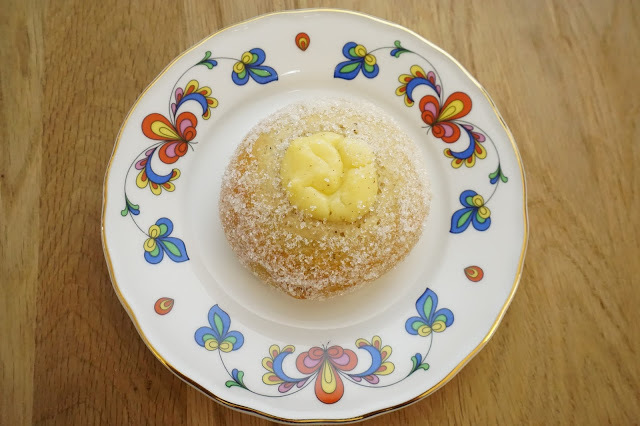 The last time I went to Sweden (this last weekend), I picked up a Swedish pastry cookbook by the pastry chef Helene Johansson, so I could make these pastries I love at home. 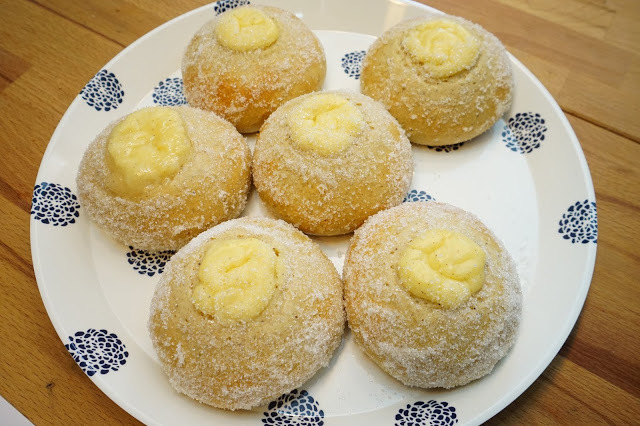 The first recipe I tried to make was for the pastry called Sockerbullar (Sugar Buns). It is this light sweet bread with vanilla cream in the middle, rolled in sugar. The cream is suppose to represent the sun, and it is one of my favorite pastries to eat when I visit Sweden. This recipe was actually pretty easy. I will translate the recipe below from Swedish to English so you can try it. I also made a video on how I made Sockerbullar, which you can see below. Start this recipe by making the vanilla cream. First, mix milk and vanilla together in a saucepan, and bring it to a boil. Meanwhile, in a separate bowl whisk the egg yolks, corn starch, and sugar together. Then, pour in the hot milk mixture into the egg mixture, and combine. Next, pour everything back into the saucepan, and whisk together until it thickens. Then, add in the butter until melted. Place it in the fridge to cool, until ready to use. In a separate medium size bowl mix the flour, sugar, cardamom, and salt together. Then, add in the butter, and mix it into the dry ingredients until it resembles bread crumbs. Next, add the flour mixture to the milk/yeast mixture. Stir together until a dough forms. Knead the dough by hand for 12 minutes or until smooth and elastic. Then, let the dough rest for 10 minutes. Next, split the dough into 6 - 8 pieces, roll into balls, and place on a baking sheet covered with baking paper. Cover the dough with plastic wrap, and a towel, and let rise for at least 1 hour. Then, pre-heat the oven to 225 C/437 F.
Next, put the vanilla cream in a piping bag, and push it down into the center of each ball of dough, piping out the cream into the center as it's being pushed down. Finally, after the bread has cooled a bit, brush the sides with melted butter, and roll into sugar. After making this recipe once, I think next time I will flatten the balls of dough just a bit so they aren't as tall. Also, I would like to try letting the dough rise for more than an hour, so the bread is even more light. I probably will also reduce the cardamom by half since it was a little strong. You can make these changes if you want, and let me know how it turns out. I hope you like this recipe. That’s it! I feel like the hardest part of this recipe is kneading the bread, and it’s a bit tricky to roll into sugar, but hopefully the video I made will help.